A blaze of fire happened April 2019 at Notre Dame Cathedral in Paris. It devastated large parts of the 850-year-old church. Thousands of Christians prayed to God to save the Cathedral. The cathedral’s iconic spire fell during the hours it took to battle the blaze. French President Emmanuel Macron prayed to God, and God didn’t listen. He plans to have people in France rebuild the Cathedral. If there really was a nice God, God would not have destroyed this jewel of Gothic architecture precious to all the world. The fire left a gaping wound in the heart of Paris. This is clear evidence there is no God who loves Christians. People have created lots of gods. 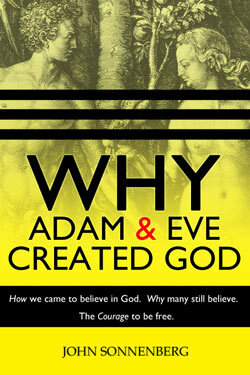 Why Adam and Eve Created God, explains why we created Gods and why most people still believe in one God. The supernatural God of the Bible may not exist, but Gods have been created by men and women for thousands of years. There is a list of Gods. This list of Gods contains the names of the Gods people created. Those who believe in God never try to prove they are right. When you search for evidence of God and proof that God exists, you find no proof, and find lots of explanations about having faith. All the “evidence” people use to reinforce their belief in God is ___ and when they hear the reality about how unreliable the “evidence” is, they feel a conspiracy is taking over the truth. The truth about God’s existence can be annoying to believers, but citing conspiracy theories alleviates the pain. No one has ever found clear evidence that God exists. Millions of people for thousands of years have tried, but not a single piece of evidence exists. Many people claim the books of the Bible are proof, but all rational people know that citing a book complied together in the Middle East 1900 years ago isn’t “Proof”. Billions of people around the world believe the book the embrace is the truth and other sacred books are wrong. Because no one on the planet can prove their sacred book is correct, its a battle religions don’t want to have because none can win the argument for their own religion over other religious. There are many common religious books in the world. Here is a list of all religious books. The Bhagavad Gita is also known as The Gita, and its meaning is The Songs of the Bhagavan. The Bhagavad Gita is scripture of Hinduism and mostly read by Hindus. The Four Books is a name of scripture known as Confucianism. Confucianism is a religion which was founded by Kong Qui in 600 BC. Most followers of Confucianism are in China. The Talmud is the primary holy book of Judaism. The Talmud is collection of practices and regulations of Jewish faith. There are two main parts of The Talmud. The initial part is called “Mishnah that was published in 200 CE and second is Gemara published in 500 CE. The Tao Te Ching is the original sacred scripture in Taoism Religions. Sage Laozi wrote it and he was also known as Lao Tzu in 6th Century BCE. The Tao Te Ching is also known as Dao De Jing or Laozi. The Upanishads is a sacred Hinduism book. The Upanishads are the last part of “The Vedas.” Read mostly by Hinduism followers known as “Hindus” and also known as Vedanta. The Vedas is the oldest Hinduism Scripture. It was written almost 2500 years ago. Its original version was written in the Sanskrit Language. The Vedas are also known as Sruti. The Bible is a popular book read by Christians and Jews. The Fact is that The Holy Bible is not a single book, but it is a collection of sacred texts and scripture edited by the Romans. The King James Version is considered to be the most authorized and trusted version of Bible. The Quran (Koran) is a popular and famous religious book. Muslims believe that Quran is the Miracle’s revelation of God to His beloved Prophet Muhammad Peace be Upon Him. (SAW). Muslims are followers of Islam and Quran is the religious book of Muslims. Titled The Ingenious Nobleman Sir Quixote of La Mancha , is a Spanish novel by Miguel de Cervantes Saavedra. Published in two volumes, in 1605 and 1615, Don Quixote is considered the most influential work of literature from the Spanish Golden Age. Don Quixote promoted freedom of religious conscience by championing the freedom to think or believe what you want to and he took the identity of a saint. The Hebrew Bible, also known as Mikra (“what is read”) or TaNaKh, an acronym referring to the traditional Jewish division of the Bible into Torah (Teaching), Nevi’im (Prophets), and Ketuvim (Writings). It is the founding document of the people of Israel, describing its origins, history and visions of a just society. Avesta is the most ancient scriptures of Zoroastrianism, as well as many Pahlavi scriptures. It includes information about the Avestan language, and other useful information for students of Zoroastrian religion. The Mormons say the Book of Mormon is a collection of writings by prophets who lived on the American continent. But the simplest and most popular theory is that Joseph Smith himself was the primary author. Who Wrote the Bible? Traditionally, Jews have claimed that all five books of the Torah were revealed to Moses on Mount Sinai. Read the Bible and you can see that there is nothing in it that a human could not have come up with. If it had just one item in the Bible that could not have been made up by a human, myself and everyone would believe in the Bible. But when we read the bible, it is obvious that every paragraph of the bible is written about something almost anyone could say or make up. In fact the Bible itself proves that it is made up. It says God loves and cares about all people, and yet won’t provide us any evidence he even exists. According to the New Testament, this damns billions of people around the world to Hell for all eternity. That would be a very mean thing, so it is obvious a loving God does not exist. Because the majority of Americans identify themselves as Christians (71%), to get elected, politicians must act like Christians and say they are Christian. This is one reason why there has never been a Jewish president. This year, there isn’t a single admitted atheist currently in Congress. Its hard to predict which politicians hide their actual religious beliefs. But some do for sure. For example after retiring, former Rep. Barney Frank (Mass Democrat) admitted he was not a believer. Not only do Christians want to vote for Christians, but many believe atheism is “threatening” to them and threatening our country so they would not vote for an Atheist. To enchant Christians, the National Prayer Breakfast is put on annually by a group of Christians. Every president since Dwight D. Eisenhower has attended the National Prayer Breakfast , which draws several thousand people from around the world, especially evangelicals, who have proved strong supporters of the Trump administration. These politicians have admitted they are not believers in God or Christian. Many admitted this after election or retirement from politics. Pete Stark (D-Calif.) In 2007 he acknowledged he was an Athist, but he had already served in Congress for over 30 years. Tory James Arbuthnot (D) Revealed his atheism after 28 years in the Commons. This list of Atheist politicians does not have any Presidents. There is one obvious past President that might have been Atheist. Barack Obama (D) Many people assume he is probably an atheist. He has not yet admitted this. Christians are taught: “Atheists are immoral” For example, Author Neil Carter claimed: “Ex-Christians can be the meanest of all atheists because they still believe in depravity but no longer possess a mechanism for forgiveness.” This is a common misunderstanding about us Atheists. There are great ethics without Gods. This is one reason I wrote this book for my family. Being raised a Christian and taught that non-Christians are evil people, I wanted show how clear it is that non-believers are just as nice people as believers. Some moral subjects that Christians address are important in life, and in most cases when an Atheist understands the human nature behind these moral subjects, they can address the morality in better ways. Following guidance in a book written 2000 years ago (The Bible) is not a good way to address modern moral dilemmas. The world is very different now and we should be making good decisions ourselves. And when a person fully understands religion, understands why people believe, and understands Why Adam and Eve Created God, moral attitudes often become much better in an Atheist than in a believer. Why would an Atheist have high morality and ethics without Gods? Atheists that understand human nature, and understand why others need God, make great decisions and take responsibility themselves. By taking responsibility is very moral. Passing off responsibility and hope to a God is wrong to do. So many people believe that God is in charge of everything and takes care of all people. This is untrue and Atheists know we all need to be responsible for everything in the world. Atheists have great mechanisms for forgiveness because they understand the reality of human nature and don’t just assume the Devil caused some evil thing to happen. When bad things happen, we see that that is part of life and have good understanding why good and bad things happen to everyone. Many Christians donate money to charities that help poor people around the world. They also pray to God to ask God to help poor desolate people in third-world countries. Christians feel they are helping these people by praying for them. That is no help and they think it is. Atheists know they must take responsibility them-selves. That is very moral. Evolution and nature provided us with nervous systems. Atheists understand human nature where believers often ignore people and assume God and the Devil control people’s soul. Understanding the evolution of humanity give people great insight into humanity. Believers who ignore evolution are missing out on this great insight. All the major religions claim that women are inferior to men. Atheists who understand human nature know everyone is different and that women are not inferior to men. Its time society, governments, and religions move on and stop discriminating against women. After the brutal but successful Paris terrorist attacks (from Isis view) Archbishop of Canterbury Justin Welby of England questioned whether God exists. The brutality of Isis and their success in accomplishing their horrible goals makes it obvious to any rational person that there is no God up there protecting Christians. 1. God loves Isis and hates Christians because He looks down from heaven and decides to ignore the Christians and make sure Isis terrorists behead Christians and gun them down. 2. There is no God, and we need to trust in ourselves to solve this problem. 1 or 2? I’ve spent many years studying this problem, and am certain that the answer is #2. I can prove it to anyone, and we would do the world, Muslims, and Christians a huge favor if we would teach them the truth. We created God and once people understand why we did this, they will be able to walk away from their superstitions. Help save lives by doing what you can to educate people about why we created God. It takes a lot of bravery to do this. Support our teachers and politicians who are brave enough to tell Isis, Muslims, Hindus, Buddhists, and Christians that we created their Gods. Religion give believers many reasons to be optimistic about their life: Eternal life in heaven. Blessings coming from God. Ask in prayer to receive what you need. Know that someone is watching over you at all times. God listens to you. The great feeling of optimism is one reason our parents, friends, and politicians want religion for us. Freedom from religion does not have to take away optimism. Replacing the dream of eternal life in heaven is difficult, but life here on earth is so great that helping people enjoy their life now will give them a feeling of optimism and excitement religion does not do. I’ve asked hundreds of Christians for just one piece of evidence that the God of the Bible created the world. Every one starts telling me the philosophic arguments for creation but no Christian has ever cited any evidence. There is no evidence a God created the world, and there is overwhelming evidence that the world evolved over billions of years. No human fossil has ever been found with a dinosaur’s. They obviously were not all created in 7 days. Here is just a small list of the millions of pieces of evidence that the world evolved. When you want to decide who is correct, creationists or evolutionists, remember this: There are millions of pieces of evidence of the evolution process and not one piece of evidence can be found to prove that God created us. If you were a student in Kansas or many other Christian schools, you probably don’t know the following facts because this knowledge was hidden from you by people you trusted. In 1856 Charles Darwin proposed a theory that all living things evolve. 160 years of amazing advances in biochemistry, genetics, and science have shown he was right. By 1900 most educated scientists understood evolution and know it to be true, but yet today many people not trained in science still think the scientists are wrong . All genes of one species are very similar to other similar species. Pick ANY species on earth and their genes are very similar to many other different species. Why: because they evolved from common ancestors. Never do we find similar species with totally different genes. Now that gene sequencing is very cost effective, laboratories, universities, and companies are sequencing the genes of all species on the plant. Genes are like living barcodes, allowing people to identify exactly any living species by its nucleic acid sequence. Mitochondrial DNA evolves faster than nuclear DNA, so scientists mapping mtDNA are able to see very small differences between species and witness evolution. mtDNA has also help identify many new species of plants and animals. Because mtDNA changes pass down through the female line in humans, the history of human evolution is also well understood. PLOS Biology Journal reported a study of 260 species of birds in North America, and the largest genetic difference they found was %7.9. Humming Birds and Mallard Ducks are related. While carefully monitoring the genetics of a single species of warblers in Sweden for 8 years, B. Hansson was able to measure genetic variations taking place between breeding pairs. Tiny changes every 8 years would add up over millions of years and cause new species to form. Researchers at Cornell University and Nova Southeastern University discovered that many of the Great White Shark’s proteins match humans. It is well know mankind evolved out of the ocean, and there is a lot of evidence to this. The Gorilla and the Pigmy Chimp differ genetically by 2.3% Humans and Pigmy Chimps differ by only 1.6%. We are closer related to the Pigmy Chimp than a Gorilla is. According to the Smithsonian, human’s DNA differs by about 0.1%. A tail, although in humans it is a tail-bone. Flat face with two eyes pointing the same direction. Two arms, two legs, similar liver, kidney, gall bladder, and many other organs. Hearts that are almost identical and beat the same. Not a single human biological trait is unrelated to a monkey’s. Had humans been created, there would be at least 1-2 complete biological differences. There are not. Every aspect of human biology is an obvious offshoot of a primate’s. Glands in our skin that secrete fluids. DNA within cells determines the nature of the cell and organism. The world is full of elements the naturally decay. Radioactive elements are formed when volcanos erupts and when molten rick freezes. The half-life of radio-active decay is very predictable and measureable, giving scientist a precise time clock buried in the ground. By dating the age of rocks founds with fossils, the age of the fossils can be determined. There are many situations where radiometric dating is not possible because of the absence of suitable minerals, so believers will cite these as proof radiometric dating is a hoax. But, there are many places and minerals that work outstanding for dating fossils. The Bearpaw Formation in Saskatchewan, Canada is layered with volcanic ash and fossil-bearing rocks. With 75 million years of volcanic ash, three independent dating methods confirm the fossils were buried there a very long time ago. 65 million years ago, a huge asteroid crashed into the earth near the Yucatan Peninsula spewing iridium around much of the earth, possibly ending the Cretaceous period and leaving a helpful time-stamp in fossil layers. Nature makes evolution so obvious. Those of us who spend time exploring nature and keep our eyes open get to witness evolution wherever we go. In Mammoth Cave National Park lives a species of blind fish. Years of living and breeding in a place where vision was not needed created a species that had no eyesight. The biologic residue of the ancient eyes it had millions of years ago is still there. It is so obvious its eyesight evolved away. A brilliant God creating a blind fish wouldn’t have also created useless eye sockets. Evolving away its vision opened it senses to smells, feelings, that helped is survive. There are hundreds of millions of fossils on display all around the world. I personally have come across millions of fossils in my adventure travels around the United States, China, and Mexico. The world is full of fossil evidence of evolution. No human fossil has ever been found with a dinosaur. God did not create all living things in 7 days. It is very obvious that all species originated sequentially over billions of years. Svante Paabo of the University of Munich has sequenced the DNA of 42000 year old Neanderthal fossils, and found that there are similar but not identical to modern day humans. This supports the hypothesis that Neanderthals went extinct, and our Homo sapiens ancestors survived. Fruit flies reproduce very fast, so they evolve very quickly. David Burney discovered and excavated a cave on the island of Kauai in Hawaii that contained 10,000 years of fossils, sequentially buried. He found 1000 species of fruit flies that exist no where else in the world. Those isolated fruit flies evolved into 1000s of species. He also found the fossils of ducks that had no wings. Sometime long ago some ducks flew onto Kauai. With no predator, the species had no need for wings and evolved into flightless grazing animals. When studying fossils from 5 million years ago, 10, 20, 100, or 200 million years ago we find hundreds of thousands of different species but not one human fossil. Why? Humans had not yet evolved. Never do we find human fossils buried with ancient animal fossils. It is obvious we were not created all together in 7 days. Buried with fossils laid down 2.8 million years we find some human-like fossils. Human-like fossils found buried with 1 million year old fossils are more similar to us, and by 50,000 year ago Homo sapien fossils are almost identical to us. Without out God, what is the meaning of life? Life itself has no meaning – It is what you make of it. We all are the result of space dust evolving into mammals over the course of billions of years. We will spend our short life on a small planet, in a galaxy filled with millions of stars and planets that is only a minuscule part of an enormous universe. One million years from now, nothing we do today will matter to anyone. At some distant point, even our universe will collapse, and not only our dust will cease, but time and space will disappear. This isn’t a popular message. You’ll never hear it from the pulpit or a politician wanting to be elected. But those of us educated in the sciences appreciate how infinitesimally insignificant we all are. This is one of the most exciting revelations I’ve had in my life. I am alive! The odds of it happening are astronomical and I’m going to make the most of the time I am. And human life on this planet is filled with emotion, creativity, relations, and adventure. Most all other space dust can’t experience this, and even less-evolved organisms can’t. We all are incredibly lucky to be here in the state we are. Your life is whatever you make of it. Its meaning is determined by what you make of it, the ones you love, and how others perceive you. There is no God to glorify. No God demands you be his servant. The “meaning of life” is not a philosophic question any more than the shape of the earth. We know earth is round not flat, and we know our life carries no more inherent meaning that the atoms of space dust that we are made of. You yourself put meaning in your life, bring joy to others, and help friends and family fulfill their dreams. It is a personal challenge and one we all can enjoy. I would never tell someone else what their life should mean, but I have defined myself in ways many others also appreciate. Help my family and friends be happy. Leave a legacy on this earth where people are glad they knew me and are better off because they did. Be happy, play hard, love, and search for ways to make myself and others happier. Assist people who suffer, particularly the those who need it, try, but can’t get it. Make the most of my opportunities for my family, friends, and co-workers. Always try to do better. Better husband. Better father. Better engineer. Be better. Help rid society of prejudices, superstitions, scams, religion, and unreasonable logic. Learn enough about art, science, history, and sports to really appreciate the life and work of others. Make memories now that I’ll cherish when I’m too old to get out and make more. If you are a God-fearing person, finding the answer to “What is the meaning of life?” will be just as rewarding and enjoyable as figuring out why we created God. My book Why Adam and Eve Created God has everything you need to understand why you believe in God and how He was created by us. But you’ll have to discover your own meaning to life. Others may want to tell you what your life should mean. I won’t. And I really hope you’ll take this one on yourself. First study my book to fully appreciate where the 2000+ Gods we created came from. It reveals why you and all other believers feel attached to god, and will show you so much about God you will be ready to let go of Him. Once you let go of God, life become so much more meaningful. For thousands of years great philosophers have debated the meaning to life. Study their thoughts and debates to see some very interesting perspective on life. There is no absolute meaning to life. No rules. No roles. No restrictions. Everyone has the opportunity to give meaning to their life. Or not. We created God, and we create the meaning to our life. In times past, we created Gods and doctrine to tell others what their life should mean. Once a individual realizes that they are responsible for life, it is more enjoyable and rewarding. I feel so sorry for people who don’t embrace life, but rather look to some ancient traditions to find satisfaction during their short time existence here on earth. Our very existence is quite short, given the vast expanse of space and time. Those of us who know there is no afterlife want to make the most of the one we do have. We really enjoy and appreciate life so much more knowing we are in control. What do the major religions teach about the meaning of life? This is another area they really don’t agree. Even most Christian denominations have different teachings about this. Here is a short list of what various religions teach about the meaning of life. Search the Bible/Torah… and discover it yourself. Listen to your conscious (the voice of God) and you’ll find meaning. Praise God and trust in Him. Everyone has a purpose. Their destiny defined long ago by God. Worship of Allah, the One True Almighty God of the Universe . Faith, prayer, concern for the needy, self-purification, and the pilgrimage to Makkah. Before too long life ends in death, and whatever is worthwhile and good, should be done. Reaching an enlightened state of mind, ending samsara (cycle of life), and entering nirvana. Respect and care for all living things. Realize the nature of life to travel down and enlightened path. Pursue wealth and joy in life. Give without expecting anything in return. What you give will be returned to you. Be good. The quality of the next life depends on the soul’s Karma in this life.